Our Company history revolves around our founder Max Katz, and his principled approach to life and business. Max immigrated to the United States in the early 1900’s from Russia with no English speaking skills and little more than a hope and a dream. After trying his luck as a butcher in upstate New York, Max heard of better opportunities in Indiana and moved to Indianapolis becoming a junk peddler in the streets of Indy. Max and a partner came across burlap bags at one of his stops which he quickly sold at another stop down the road. Seeing the great opportunity present, they began to specialize in burlap. 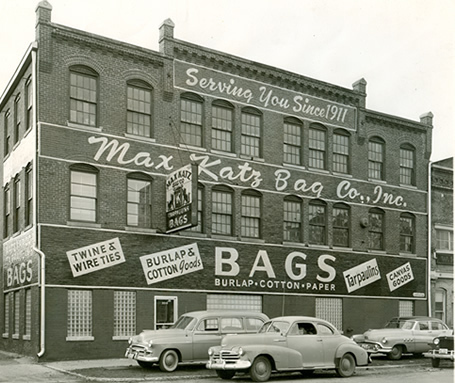 After being robbed by a “highway-man” on the road one night, Max’s partner quit, but Max pushed on, forming Max Katz Bag Co. in 1911, soon employing over 300 people to sort, patch, and sell used Burlap and Osnaburg bags. After the price of bags plummeted post WW-I, Max went broke but refused to declare bankruptcy. Convincing the banks to loan him more money, Max started all over again and successfully paid off all of his debt. With the help of Max’s 5 children, the company developed the ability to manufacture new bags in the early 50’s. Flexible laminations soon followed in the late 50’s and 60’s. Max Katz Bag Company first extruded plastic in 1969 and has since developed extrusion coatings, blown film (mono and co-extruded), and converting and reprocessing processes for the packaging, construction and absorbent industries. In the mid 80’s, Max Katz Bag Co. began an ongoing process of becoming a Computer Integrated Manufacturer (CIM) as a matter of foresight for the market to come. It is that choice to integrate and automate which has allowed Max Katz Bag Co. to remain a competitor in the world market from then until today. The 90’s saw the addition of Hi-Tenacity multifilament spinning equipment, as well as more recycling and extruding equipment, which has positioned the company for efficient production as well as growth. Since the roots of our entire company began from the recycling of Burlap and Osnaburg bags, we have always placed an incredibly high priority on recycling. That is why we have always insisted on having a recycling division with ever-expanding capabilities on the factory floor. We look forward to the new challenges the future will bring us, and are prepared to handle each one through higher productivity, quality, and accountability. Generations of Max’s direct descendants and their spouses, totaling more than two-dozen members of the Katz family, have contributed to the continued success of the company. There are currently 3rd and 4th generation Katz family members working to continue this futuristic, ever-expanding, environmentally friendly company. Many others have come into the company, therein becoming a valued member of our extended family without whom the company would be nothing today. The Katz family and the Max Katz Bag Co. family invite you to see for yourself just what we mean when we say, "We strive to be a quality leader in everything that we do."